A major enabling factor of modern democracy was the relatively cheap dissemination of knowledge (beyond the rich) that was brought on by the first media revolution, when the printing of cheap books in the vernacular was finally realized with Gutenberg's Bible. What this lead to was the Renaissance and an explosion of scientific and intellectual capability that is at the foundation of our present democracy and the resulting high standard of living. For the first time, superstition and fatalism were supplanted by the notion that the problems humanity faced could be addressed and rationally solved and that the more members of a society that entered into this endeavor, the greater the chance for success. In what more and more appears like a reverse Renaissance -- aka self-inflicted Dark Ages -- those in power seem to be seeking the destruction of public education, so that the reflective thought necessary to question and hold accountable the greedy leadership of this country will no longer exist. 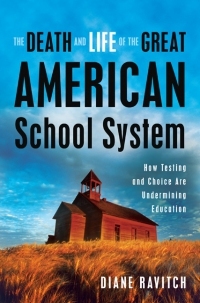 In The Death and Life of the Great American School System - How Testing and Choice Are Undermining Education, Diane Ravitch concisely analyzes the very real threat to a viable constitutional democracy that consciously chooses to vest power in an educated citizenry. From 1991 to 1993, Diane Ravitch was Assistant Secretary of Education and Counselor to Secretary of Education Lamar Alexander in the administration of President George H.W. Bush. Ravitch is a research professor of education and education historian at New York University. "She was responsible for the Office of Educational Research and Improvement in the U.S. Department of Education. As Assistant Secretary, she led the federal effort to promote the creation of state and national academic standards." Beyond the strength of the arguments she makes in questioning the much touted educational reform we constantly hear about in the media is the fact that this politically conservative educator is coming up with the same critiques that politically progressive people have leveled at constantly changing public education reforms that never seem to come to fruition in any measurable way, except in the profits that these reforms seem to generate for everyone except the students. Throughout most of her career in education Diane Ravitch had been "enthusiastic about -- testing, accountability, choice and markets," but now has come to the belief that these once thought of indicators of academic success appear "hijacked," by the same forces that seek privatization of healthcare, the military, or anything else that could lead to a profit without any consideration as to there effectiveness or societal consequences. Professor Ravitch is particularly concerned with the unfair advantage that publicly funded charter schools have on public and parochial schools. While I would agree with her conclusion that charters are drawing off the most motivated parents and their children with the aid of well-endowed foundations, I would go a step further in explaining why this is possible: when all education reform refuses to address the continued existence and failure of public school districts in their present form, motivated parents and students are offered no viable alternative to charter schools or other reform models that only exist, because it is not possible to hold public school districts responsible for their ongoing failure. Professor Ravitch no longer sees "testing, accountability, choice and markets as anything more than unsuccessful indicators as to whether longstanding academic failure has been redressed," because it has shown itself to be a series of "panaceas and miracles cures." If a charter school like Green Dot's Locke High School in South Central Los Angeles could turn around the damage that has been done to its predominantly minority student population in one intensive year as founder Steven Barr has asserted to us, then one might logically ask why we spend 12 years in school in the first place. Even Mr. Barr is honest enough to recognize that charters are not a long term solution, as the school districts must be compelled to start doing their job. The reality that politicians seem unwilling to deal with is that longstanding failed schools do irreparable damage the longer students have the misfortune to remain in them. In positing a real model for public education, the first challenge will be to honestly face up to the difficult task of salvaging as much as we can of the students that are presently in the system as they should not continue to be sacrificed to clearly failed policies. In doing this, we will gain the expertise to assure that their little brothers and sisters will not have to suffer the fate that they have. It is only in a Hollywood movie about education that "all students -- including those with learning disabilities and English learners" can be brought to "proficiency in reading and math by 2014." While clearly many teachers have been burned out by the insanity that inner city school districts allow to continue, it is a dishonest and simplistic notion to lay the blame for this failed system at the feet of teachers alone, who have had no say in its structure. Ravitch mentions "statistical misreading, illusory achievement" and "morale-destroying coercion of teachers and principals" as existing public education policies that totally preclude real pragmatically driven reform. How can one reform education, if these policies are alive and well? But ideas like this appeal to the pedagogically naive Broad and Gates Foundations that are being told this lie by their only point of entry into public education -- the same entrenched public education leadership that is responsible for the problem in the first place. This weekend I met with a group of conservative Republicans and another group of historically Democratic Latinos. There was no disagreement that both groups had to actively get involved with public education, if there was to be any real reform. Not having Professor Ravitch's book in front of me, what is her solution if the answer doesn't involve testing, accountability, school choice or charter schools? While I agree that charter schools are not the solution to our education woes (Sorry Meg Whitman), they do serve a purpose. They provide a little pressure on school districts to improve. With the competitive pressure that charter schools create, some school districts have made steps to start implementing practices that work in successful charter schools. I also believe that the CAHSEE, while a minimal test, does provide another little bit of accountability. Parents of 10th graders who have a long history of 'A' and 'B' grades, but yet can't pass the CAHSEE, are putting pressure on school districts to help their students pass the CAHSEE so they can graduate. It requires a diploma to mean something. Not much, but more than it meant before the CAHSEE. Additionally, NCLB, while a long way from perfect, has put a little pressure on school districts to make some efforts at change. Even those who embrace the status quo are using the vocabulary of achievement gaps and high expectations. I think people use the 100% by 2014 as an excuse for not trying to improve. Since the goal is "too hard" to reach, they argue that they shouldn't try. For me, the fact that there are schools across the state, charter and traditional public school, that are successful in closing achievement gaps and raising achievement for all students proves that education reform is worth the effort. It can be done. It can be done in our present system of almost no accountability. Real reform just requires dedicated educators, who are willing to accept the idea that they might need to change how they do their job, whether they're a principal, teacher, aide or counselor. Successful schools do things differently than failing schools. Let's learn from those who are successful! I believe we need to stop focusing obsessively on standardized testing as the sole or primary means of educational assessment. I understand that standards-based reform of the NCLB variety was embraced by many for progressive reasons, but the results have been a deadening of public education on so many levels. Other means of assessment, qualitative means, while almost certainly more costly than standardized tests, could provide a truer picture and would have the added benefit of liberating students from the continual round of testing, which is siphoning off energy from teachers and students alike. I would repeal NCLB in a heartbeat if I could. I would also scrap the CAHSEE. I don't believe in focusing on testing to the neglect of human experience. If you were the education czar, what would you use for a system of assessment? 1. Charter schools only exist, because government/people are not willing or able to reform rich and politically connected public schools- kind of like trying to reform healthcare. 2. To the extent that charters or any other model of school reform addresses students early enough and where they are engaged at their subjective academic level, they succeed. 3. When assessments are given by people who see their jobs depending on the results of those assessments, their validity is strongly in question. Why am I given the answers to periodic assessments that I will not grade? 4. If minority children are allowed to arrive at school having heard millions of less words than their White counterparts, then they start education at a distinct disadvantage which most never recover from. 5. A system that depends on parents who themselves were the product of failed public education, has little chance of succeeding unless the deficiencies of the parents are addressed contemporaneously. Legislating civil rights in the 1950s and 1960s does not mean that you have addressed the real damage the 400 years and counting of de jure and de facto racism have done to people. Ravitch and anybody else who is serious about fixing public education realizes that it will require a rigorous academic program that will require specialized skills to salvage as much as we can for the students presently in the system, before endeavoring to never allow any student to fall so hopeless behind as has become the rule in LAUSD and other predominantly minority filled urban school districts. This task is not accomplished by single-subject secondary school teachers in junior high and high school- then, it's too late. Ravitch points out that in 1905, the formation of big centralized urban districts was seen as a reform of the corrupt local districts in New York City that existed at the time. I think we're basically on the same page here. you'll notice I "little" pressure and accountability. And I mean little. Our state's system of public school accountability is as little accountability as possible. School Districts always pick the "other" major reform strategy, so nothing ever really changes. That's why we have schools that have been in Year 5 of Program Improvement for years with few real changes at the school. I agree completely that if a student reaches middle school behind, the odds are, they'll never catch up. Social promotion should end. If a student hasn't mastered the knowledge and skills for 2nd grade, why do we insist on sending them on to 3rd grade. Unless they have an outstanding teacher, they'll continue losing ground every year until they drop out.